Barons team with WIAT 42 & iHeartMedia's NewsRadio 105-5 WERC for annual event. 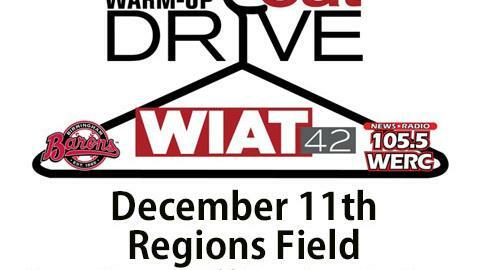 Birmingham, AL - The Birmingham Barons announced Tuesday they are partnering with WIAT 42 and the team's flagship radio station, iHeartMedia's NewsRadio 105-5 WERC, to bring the Winter Warm-Up Coat Drive to Regions Field. Beginning Thursday, Dec. 11 at 5 a.m., new and lightly-worn coats can be donated at the ball park, along with multiple drop-off stations at the Lakeshore, Montclair and Trussville Wal-Mart locations. "We are always looking for ways to give back to the community and this is the perfect opportunity," Barons General Manager Jonathan Nelson said. "We are excited to team up with WIAT 42 and iHeartMedia for this worthy cause. We hope to see a great turnout Thursday as we give help to those who need it most this holiday season." The drive is scheduled to run until 6 p.m., and those interested in donating to the cause are welcome to stop by any of the four convenient locations at any time. All coat sizes are welcome and appreciated, including coats for children and adults. "The Birmingham Barons have always been great broadcast partners with us at NewsRadio 105-5 WERC," Program Director John Mountz stated. "We both have a common purpose, to serve the public in Birmingham and the greater Birmingham listening area. It is for this reason we are honored to once again partner with the Barons on this worthy endeavor." Barons' mascot Babe Ruff is set to visit each location throughout the day, while WIAT 42 on-air personalities are set to greet participants at Regions Field. The CBS affiliate will also broadcast from the stadium, featuring live shots during the evening news. "There is such an urgent need to help families stay warm during the winter in Central Alabama," WIAT's Andy Caliendo said. "WIAT 42 is proud to partner with the Birmingham Barons and be a part of the Winter Warm-Up Coat Drive. We're committed to our community and this is just one way we're working to serve our viewers. WIAT 42's dedication to providing 'Coverage You Can Count On' not only applies to news and weather coverage, but also to our community." Birmingham opens the 2015 season Thursday, April 9 as Regions Field hosts the Mobile Bay Bears at 7:05 p.m. For information about the Barons Regions Field and the complete 2015 schedule, please call (205) 988-3200 or visit www.barons.com, www.facebook.com/birminghambarons or on Twitter: @bhambarons.